The white death dropped over the weekend, covering my home and the surrounding area in a blanket of ice and snow, which melted and only to become more ice. Lamont and I debated how or dog would take the change in weather. I maintained that having spent the first few years of her life as a stray, she would turn a nose up at the stuff now as there are reasons I refer to her as Her Royal Highness. Opening the door, it was my intent to take a photograph of her reaction to the wintery mix and quickly return inside. I stepped out on our porch wearing only a set of pajamas. Her Royal Highness followed. She took one dignified step forward. Then another. Her nose touched white stuff on the ground. There was no bounding around. No rolling around, digging, or otherwise acting mystified. I knew it! Snap went my camera. “Okay, let’s go back inside,” I called and turned expecting her to pass me, only too happy to return to the warmth indoors. Her Royal Highness had other ideas. 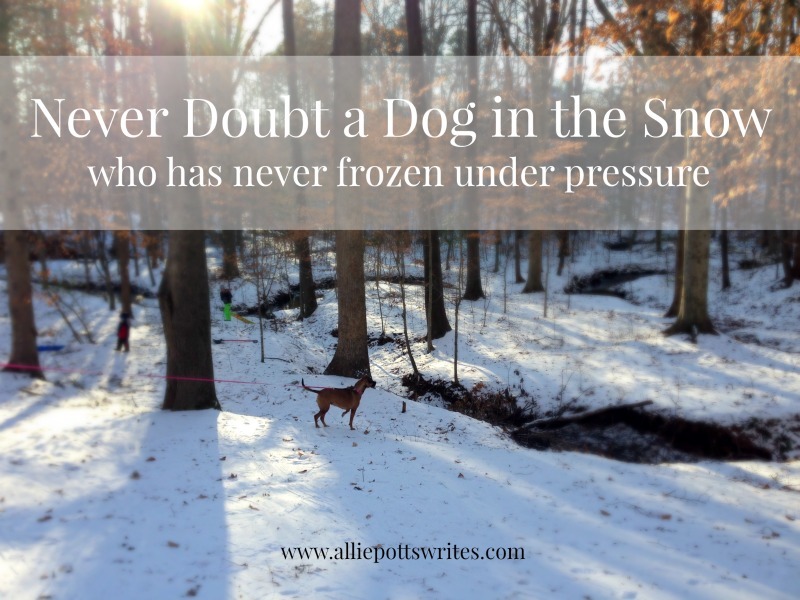 The frozen ground crunched as she trotted down the street as if it was a beautiful 80 degrees F rather than 20. “Where are you going?” I called. “Get back here now.” I should have saved my frozen breath. With no other choice in front of me, I took off after her, bare feet and all. Her Royal Highness looked up and wagged her tail misinterpreting my presence to mean this stroll around the grounds was now sanctioned trotted further. I shouted her name a few more times. She sniffed a bush. My feet burnt with the cold as I closed the distance between us and could only imagine what I must look like to my neighbors – my hair, still wild from sleep, was now covered in ice crystals and bit of snow. My toes leaving tiny naked prints where I ran. I called some more, repeating the command to return while infusing my voice with my best mom tone. Her Royal Highness, still the embodiment of confidence, sniffed another bush as if she hadn’t a care in the world. Great. This is what I get for thinking she wouldn’t be able to handle a bit of cold. I was still several feet away when she suddenly turned around and walked, most regally, back to our yard, up the stairs, and inside where she promptly buried herself under a blanket. My boys, celebrating her return, joyously covered her with even more blankets. She burrowed deep and was asleep long before the feeling completely returned to my toes. Clearly, I won’t be making a living wage on the casino floor anytime soon. There are a few lessons to be learned here. There are the obvious ones: don’t let you pet off leash in an open space, even if cars aren’t driving and only nuts like yourself are out and about, unless you are confident they will respond to voice commands or always wear proper footwear even if you only think you will be in the elements for a split second, but the bigger one here is there is no glamour to be had in publicly doubting another and even less fame in doubting one’s self. *quotes courtesy of http://www.brainyquotes.com. Photography is my own. Leftover debris from summer storms accumulated in a pile in our yard, larger this year than most. Outside temperatures finally cooled to the point one can actually stand to turn the air conditioning off. Both were signs that it is truly Fall once more. My boys, including the biggest kid of them all, eagerly piled as many limbs and dried leaves as they could in our fire pit and soon the evening was lit by its merry blaze. The activity caught the eye of Her Royal Highness. Leaving the couch she has assumed as her throne, she padded her way to the edge of the fire ring. The boys threw another pine cone or two on the pile, sending ash and embers in the air. Her Royal Highness was not impressed with this display and returned post-haste to a more cushioned viewing distance. It was one of those times I was reminded how very different she is from our late dog. He was much more possessive of the great back doors than she ever has been. An errant snap of a branch or roar from a car in the distance would have sent him running outside with his hackles at full attention. He’d hold his ground in the middle of the yard and bark at least a half a dozen times before running along the length of the fencing to ensure that the perimeter remained secure. Only then would he return to our side with a huff, puff, and or snort. Could we not sense the unseen danger? He would ask without words, our fireside evenings anything but relaxing. There could be squirrels out there, cats, or even worse, deer! Eventually, his doggy paranoia would grow too much and with another huff, snort, and ruff, he’d trot off for another inspection of the parameter. My dog took our protection seriously. When he wasn’t in the yard, we often found him on guard at the window. Shortly after he passed, I remember staring into the fire afterward, listening to its pops and crackles, and thinking to myself how quiet the evening was without him. Motion caught my eye, a shadow against our fence. The shadow moved as the fire blazed, and I swear it was dog shaped. As quickly as I noticed it, the shadow shifted across the fence as if my dog running his defense of our perimeter one last time. I know the light can play tricks on you and eyes can sometimes make something out of nothing, especially if there is something they really want to see, but this time of year I can’t help but wonder if there may be truth to some of the stories about things that go bump in the night. And maybe, just maybe, that’s not a bad thing. I’ve never seen that shadow again, nor heard a bark from a dog that was not there, but it was enough to make me ask what if and think about other impossible things. I am a huge fan of paranormal stories in general, particularly so, this time of year. 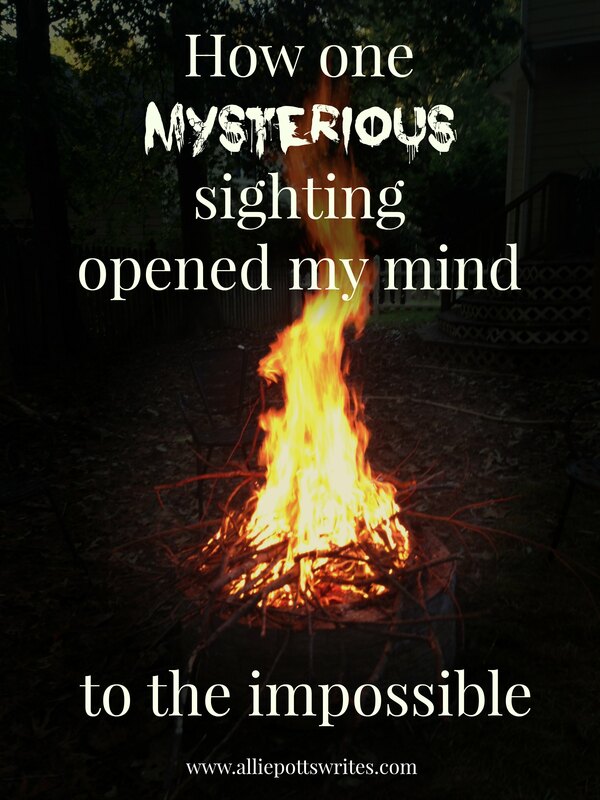 The thought that there may yet be mysteries out there for us to discover thrills me. As much as I miss my late big sweetie, I am in no hurry to learn the answer to the question of whether or not there is life after death beyond what I take on faith. But that doesn’t mean there aren’t other mysteries to ponder or other discoveries out there to make. Imagine if Einstein or other researchers or scientists had stopped their work just because everyone told them the questions weren’t worth asking, or the task, impossible to perform. This is why it is so important to maintain an open mind, to accept that there are things we do not know, and to challenge the things we think we do. While some ideas may prove to never be anything more than a good fireside tale, there remains plenty out there for humanity to discover if we are only willing to consider the impossible. If you have a spooky story of your own to share or would like to share a bit of news that no one else thought possible, feel free to either submit it or the link in the comments section.